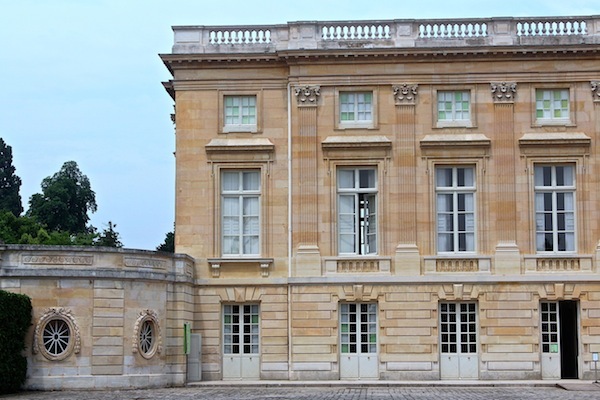 Today we travel back to Versailles to take a quick look at the Petit Trianon. Built by Louis XV for his influential mistress Madame de Pompadour, who died before she could ever inhabit it, it is Marie Antoinette who is most associated with the charming chateau. Given to her by her husband, Louis XVI, it became her refuge where she could escape the demands and formality of court life. And not unlike Jackie in the White House, she was the only queen to have asserted her style at Versailles. 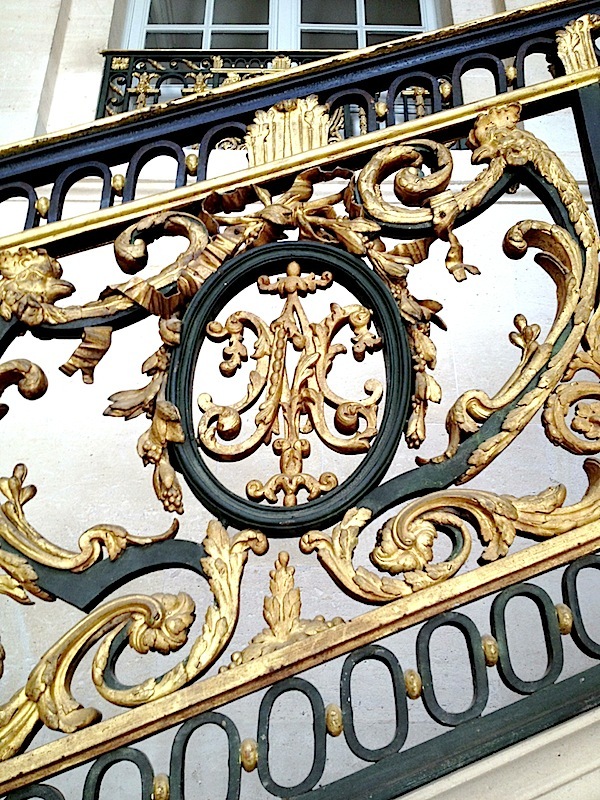 She even had her elegant personal monogram replace that of Louis XV in the amazing wrought iron and bronze-gilded staircase made by Francois Brochois. But let’s back up. You enter through a charming courtyard. 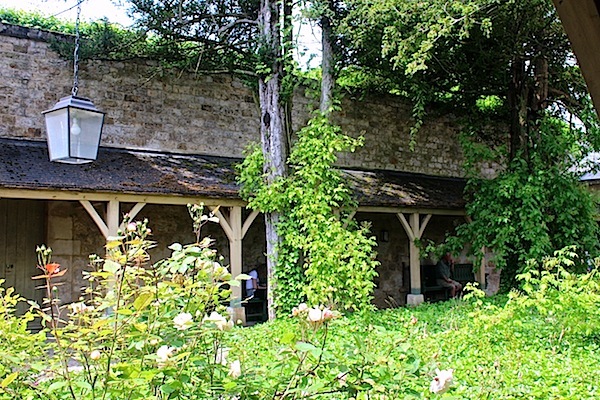 The building is sited in the middle of a garden, part of which Marie Antoinette turned into an English-like park with follies and a hamlet. The rustic setting is in direct contrast to the grandeur of the palace. 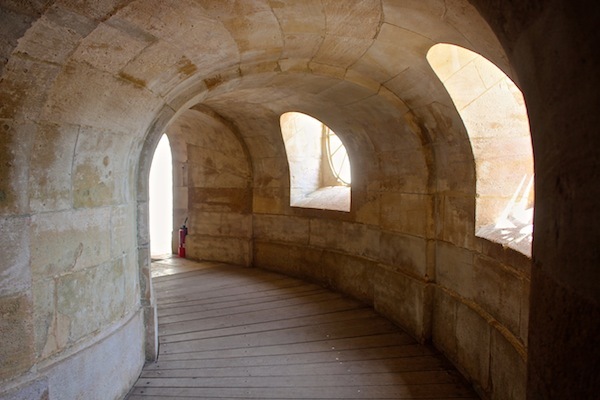 Upon entering, the sinuous architectonic hall alludes to the cleaner neoclassic style of the building. While still embellished, it has a more restrained and ordered feeling. On the ground floor is what appears to be a kitchen with handsome copper pots stamped with the name of the Petit Trianon. 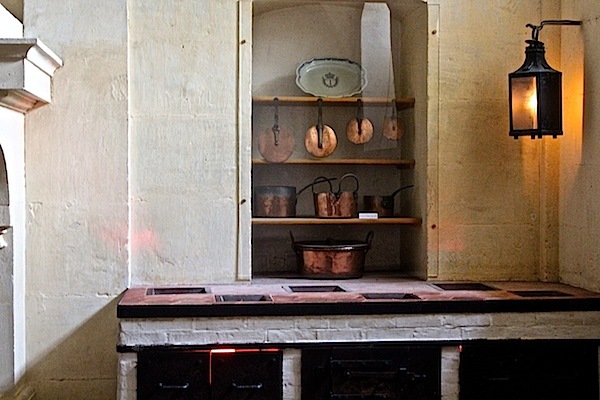 But this room was really only used to heat the dishes – the meals were prepared in outbuildings on the estate. 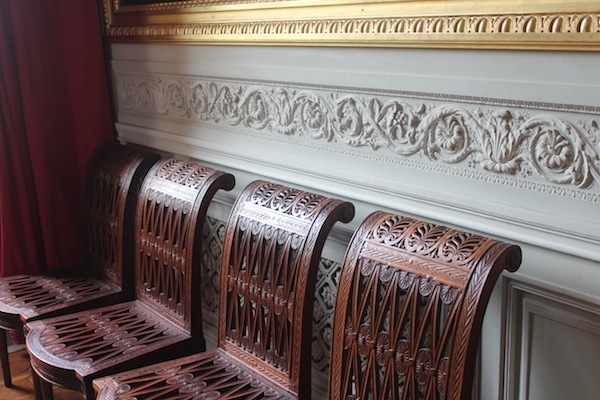 Continuing up to the first floor, a tailored antechamber where I spied these incredibly decorative andirons. Honoré Guibert was the creator of all the wall sculptures and I would imagine completed the carvings surrounding the hearth as well. 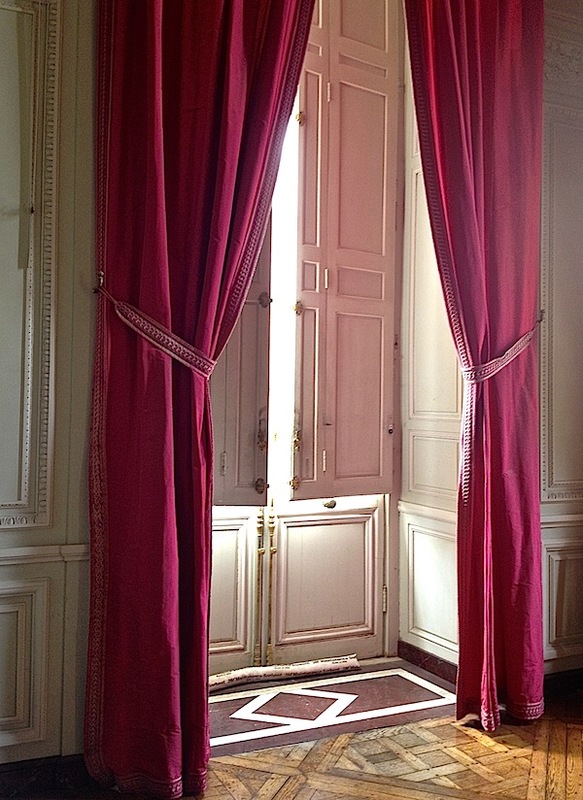 Simple curtains frame the beautiful deep windows showcasing the elegant woodwork throughout the home. A closer peek at the detailed hardware. The living room also functioned as a game and music room with stunning paneling and carving by Guibert. The intricate decorative detail is Louis XV’s monogram – two intertwining “L’s”surrounded by myrtle leaves under a crown of roses. 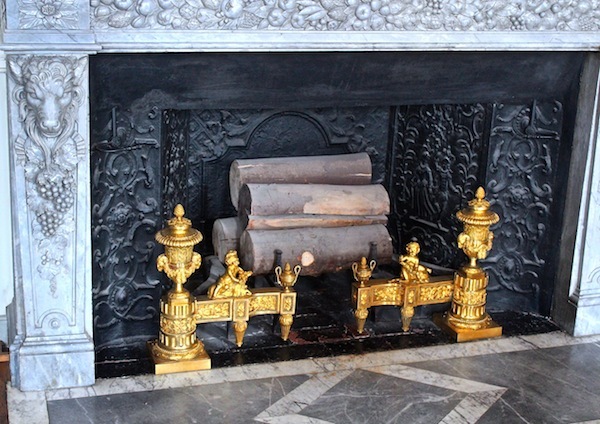 The impressive mantle is of purple breccia and the damask, from Lyon, was one frequently used in 18th century palaces. 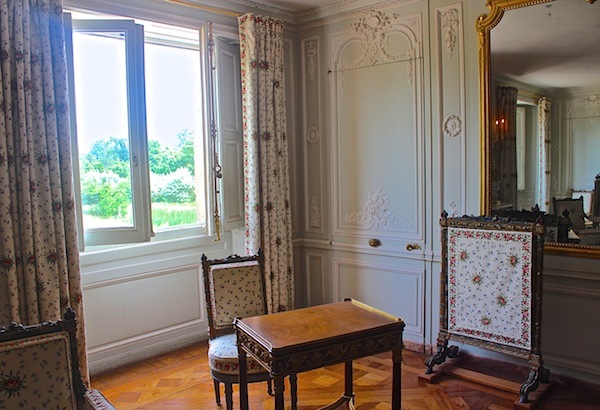 A dining room features more exquisitely executed wainscoting by Guibert. 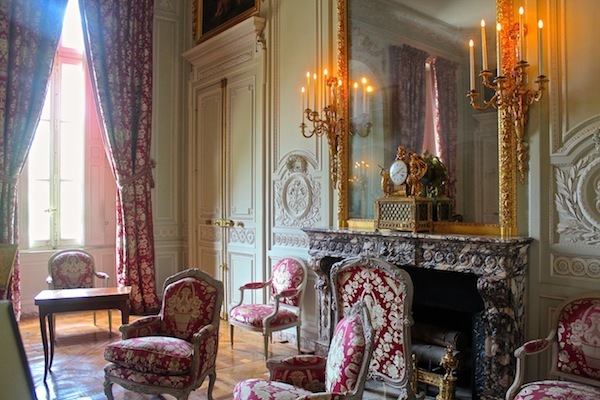 The chairs are Georges Jacob, one of the most celebrated early neoclassical French furniture makers. And finally on the first floor is the Queen’s bedroom. What a difference from her chamber in the palace that we saw in the post earlier this week. 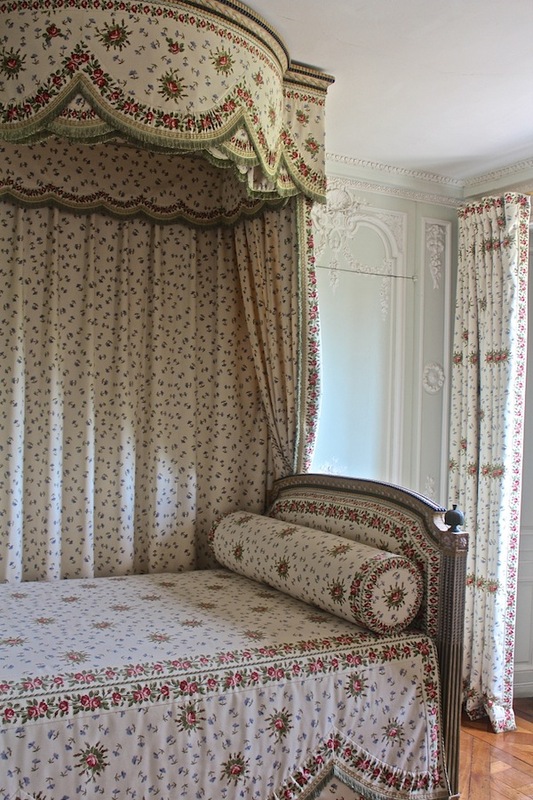 While the bed is a reproduction, the embroidered upholstery is original! 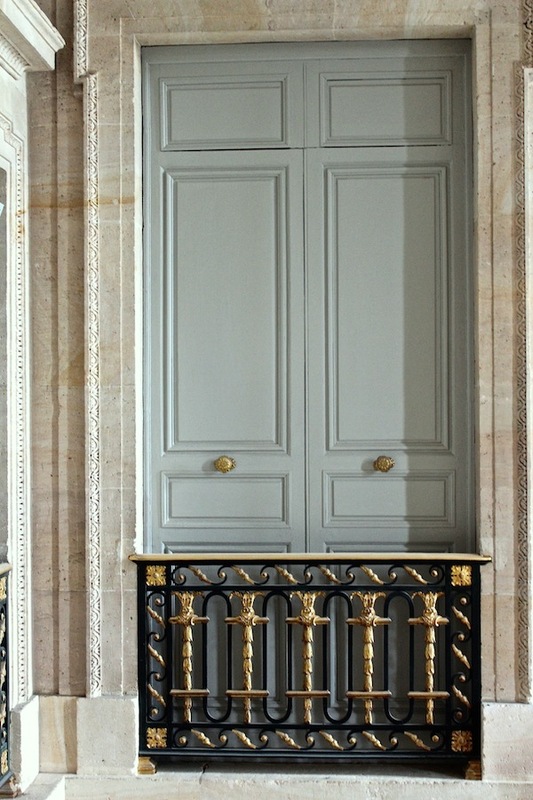 Check out the fantastic jib door and how perfectly aligned the wall carvings are where the door separates to open. There were many elegant moments throughout. I adore the combination of materials and colors in this vignette – it could translate as wrought iron (or perhaps black lacquer), brass, limestone and a perfect grayish blue-green for an interior today. Upon leaving, you can see the facade of the building and notice the influence of the burgeoning neoclassical with its referencing the cleaner lines and classical elements of Greek style. 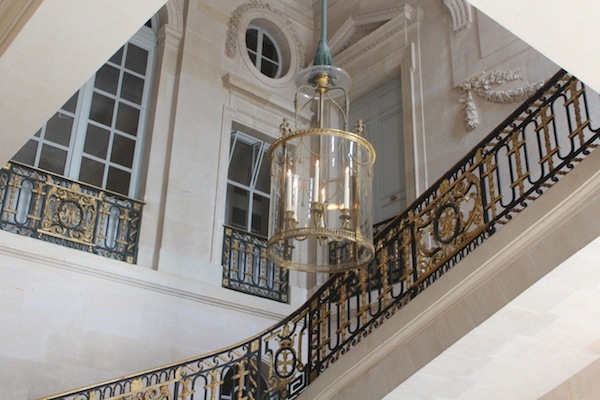 And credit must also go to Breguet, who financed the complete restoration of the Petit Trianon in 2008. If you are not familiar with the saga of their famous Marie Antoinette watch, you can read a recent article about it here. It would be easy to spend an entire day or more at Versailles. If we had had more time, it would have been lovely to see the rest of the estate. This entry posted in architecture, design, furniture, interior design, travel. 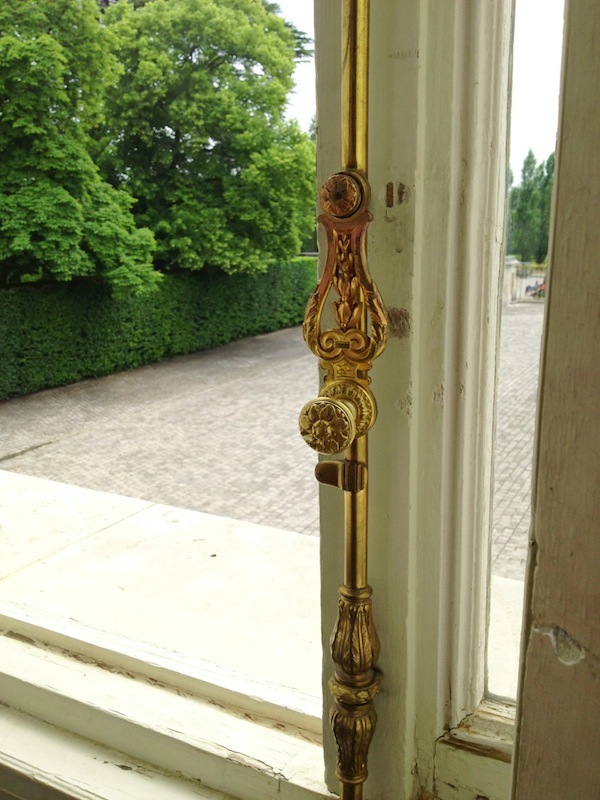 Entry Tags: France, interior design, Marie Antoinette, Versailles Bookmark the permalink. I spent a week in Versailles several years ago, since it was late October, they were cutting back the gardens, so I could see the “bones”–I was able to visit the grounds part of every day, usually after all the tourists had gone. I would rent a golf cart and explore the wonderful grounds. I hope you had a change to visit the Potager de Roi then go for lunch or dinner at the restaurant of the same name. Superb. Petit Trianon has to be my favorite at Versailles. Your photos are lovely, Stacey. I found the interiors difficult to photograph, but you’ve captured it beautifully. Versailles is one of my favorite places. Beautiful blog and pictures, thank you. 78 queries in 0.510 seconds.